Hi there ,and welcome to I Wear Tight Genes, an account of my work on my family tree site as well as publishing old family photos to my Picasa web gallery. In case you're curious, the photo to the left was taken circa 1970. That's me, along with what my mother assures me are not a pair of rabid dogs, as one might have assumed seeing as my parents are arranging them in fighting position. 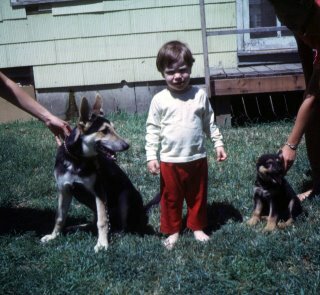 In the 36 years since this picture was taken, you can rest assured that I am still the same cute little boy, wearing tight red 70s pants with German Shepard puppies just waiting in the wings in case someone needs to take a picture of me. Spending most of my life sitting in front of a computer for those years hasn't softened me one bit. I mean, look at those abs! You could, I don't know, boil an egg on those abs! ...that's the saying, right? Anyway, if you're interested in genealogy at all, I'll be posting links to my discoveries as I work through this mountain of information. Additionally, if I find something worthy of a post that's peripherally related to my quest, I might just strike together some keys for that as well. Finally, as I reach out and contact members of my extended family, I'll be using this blog to humiliate them publicly. So, fair warning if we share genes. Well, Thomas, I read some of your posts and was entranced. You seem like a really nice person who writes beautifully about your family. I see few comments...wonder why, as this could really be entertaining! Hope this finds you well and still searching.